Let's just my tag looks nothing like Day 10, as I took the creative liberty to combine a few elements from the last few days long with Day 10. Besides, I finally purchased the Reindeer and that Tree Embossing folder that I just had to have (Early Christmas present for me!). 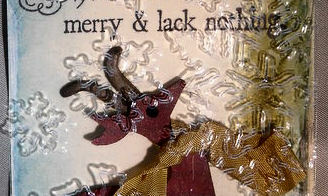 Of course I just had to ink up my favorite Holiday sentiment from the Artistic Outpost Snowy Woods plate again. I covered the Reindeer with some beautiful Memory Box papers, made my own antlers (the swirly ornamental die was out of stock LOL). Added some embossed trees and a lightly snow dusted dirt mound. Because I don't have the Tag Die (shocker, right! 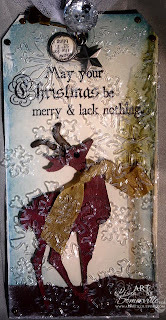 ), I embossed the packaging from the Embossing Folder a few times to add additional snowflakes, then placed it over the tag and simply cut around it. Off to clean my studio as it looks like a tornado went through there this week. Gasp! Oh. My. Gosh! I LOVE THIS!!! I want to make one!!!! I am SO doing this RIGHT NOW! Thank you SO much for thinking this up! Amazing!!!!! Have fun cleaning your stamp room up! Then you can start fresh all over again! You are so good....done before it even gets dark! Beautiful tag, you did good! Your tag is wonderful! I am hoping the "lack nothing" part of that stamp means when we wake up Christmas morn everything Tim we don't have will be there. So fabulous! I love the effect of the overlay--off to my craft room to see if I can figure out how to do that :-) Have a great weekend. Beautiful Lisa! Love the look of the overlay. Very creative! lovin the reindeer on your awesome Tag, I seem to be doing alot of improvising myself!